Besides a "pat on the wood" a couple of times, my first time sitting to weave was six weeks post surgery where I wove for about 10 minutes and I had about an inch to show for it! Go me! It was a busy time with physiotherapy and doctor visits and all the other things that had been put on hold for the past six weeks. I would weave a bit but gradually increasing the time as muscles and even the bones adjusted to the new activity. It didn't help that the silk is quite fine and so there's a lot of treadling to get some mileage to show! So with a new understanding that this was simply going to be a slow process, I just wove a bit every day or every other day. There was a huge victory cry when the scarves and samples were finally finished!! Fringe twisting got under way the following day as well as adding some fresh water pearls to the plum paid version. Nothing added to the black scarf as it could be either masculine or feminine. How do I know this? My husband did some serious 'jonesing' for it until I pointed out he has several scarves in a drawer! They got a gentle hand washing in the laundry tub and a night to drip dry. Next day they pressed up nicely with some steam and I nipped off the excess fringe from the twisted tassels with a rotary cutter. Then came the beauty shots... some project details for you. I used 30/2 bombyx silk, tussah silk, and silk yak blend, all approximately 30/2 in weight as my warp. The sett was 36 epi. I used a twelve dent reed and three ends per dent. The black weft is 30/2 silk commercially dyed for a deep even black. It showed off the "boxes" nicely! The second scarf took on a different look with a cotton silk blend I bought from Treenway many years ago and hand dyed it myself. It was an uneven dye job so the colours vary from soft plum to a touch of eggplant. This effect created an almost plaid like effect in a soft way. The black scarf is 7 by 68 inches and the plum plaid is 7 by 72 inches and both are very light in physical weight as the silks used are fine. (Both were woven to 74 inches so you can see the shrinkage in the length. They lost half an inch in width.) I even managed some samples for my files as well. The next warp or two have been planned and one is well under way. I discovered that standing still at the warping board really hard on both my new hip, but in particular, my left knee which has been complaining loudly of late. I would stand and wind like a fiend for a few minutes, then sit down to rest and repeated the process. This seriously hurts my bones and so I turned to the internet and started looking for a warping reel. 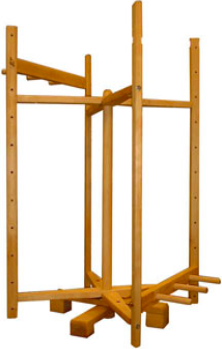 Schacht has a horizontal model for $399.00 USD . *gulp* Too rich for my budget. I looked for Canadian alternatives and drew a blank. 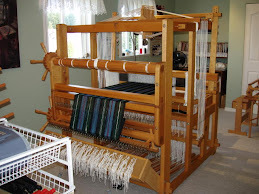 Then I realized I was staring at the Woolhouse Tools Loom and then turned to their web page to see what they have! They are winding down their business and so if there is an empty blank line after the product name, it means its sold out and not being replaced. Well imagine my surprise when I saw they have a two yard vertical warping reel and it was on sale! From ordering to arrival took three days and its now assembled. It can hold up to twenty yards +/- which is six yards better than my existing warping board. I completed my ongoing warp on the warping board, but I will give the reel a whirl for the next! I would also like to announce that Handweaving.net has just relaunched their web site and it's a tremendous improvement over the old. Fast, colourful and just plain fun to go and play with the drafts. 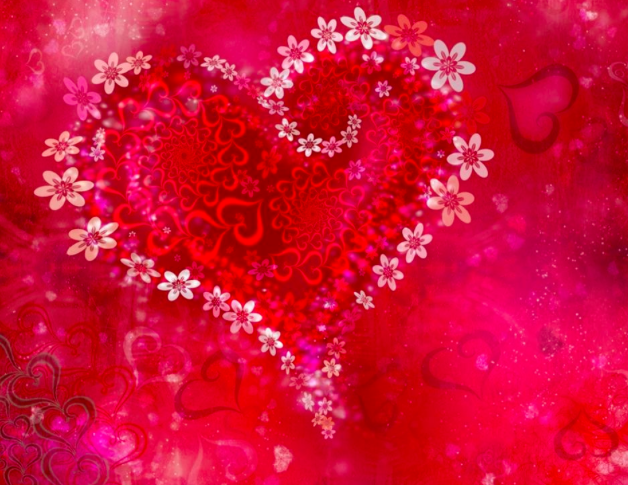 I left a small donation via paypal to help with the web fees to show my appreciation. Its a wonderful resource for weavers of any level! We had our realtor in place, downsizing underway and even a possible interested buyer but we soon realized that we simply don't have enough time. I had a call from my surgeon's office last Monday and it seems that they want me to start my pre-op tests as early as first week of April and I see the surgeon the third week of April. 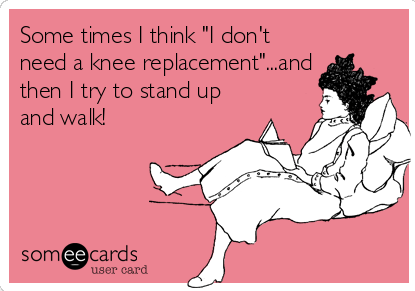 My knee replacement can come as early as June...or... as late as October. We had a discussion on the news and we decided with a time spread like that, a move is not a good idea right now. (Too much stress as well.) Another year here will give us time to get things better prepared, and hopefully sell the big loom and a bunch of other stuff! It does mean I will be coming home to a flight of stairs which doesn't thrill me too much but we'll figure a work around. Might just move the looms to one side and sleep in the studio? Here's a painted cotton and rayon warp I got from Blazing Shuttles. I can see two delightful scarves coming from this! Great colour combination, and the rayon shiny 'blips' will add some interest! This is another one of Blazing Shuttle's painted warps called "Black Opal" and was based on an actual fire opal's intense colours. I see it paired with black and.... well, that's top secret for now! Let's just say I have big plans for this! It's 10/2 rayon and so quite fine. So with that in mind, I went looking for my black weft. This is Bambu 12 and in colours Onyx, Truffle and China Red. The black is for the Black Opal project, the truffle beige I thought would be lovely paired with cream silks and the China Red was an attempt to find a replacement for a lovely deep red shade I had in 10/2 tencel called Persian Red. They don't make it any longer and my searches for any residual stock somewhere have failed. China Red bambu is lovely but its not the same as the Persian Red. Bambu 12 is 6300 yards per pound. The three colours together would make a lovely turned twill arrangement wouldn't it? Cotton Clouds also sent along a colour card for the various colours they carry. I can see a few colours I would like to get in the future..... and three I wish I had now! I love the three colours on the bottom right: willow, blue mist and blue mist. The double asterisk means "available seasonally"..... but which season? I'll be asking soon! This was actually a "get well gift"! Nice huh? Deep purple and a colour called Algae silk hand dyed by Dye For Yarn at Etsy. The algae is like a bronze and I think I will pair these colors together. The 20/2 skeins are 50 grams each so there's enough for warp and weft. Silk is lovely to work with. Now this is my "new" old, gently used Royal 500 gram ball winder. I found it on a sales page. I had another large wooden ball winder but the handle for turning was set horizontally and I found it hard to use with my arthritic hands. It was awkward on the wrist as well. So I put it up for sale and it went to a new home to a happy new owner. Then with the sale proceeds I bought this used winder that has a vertical handle, and even has a tension device to boot to give you a neatly shaped centre pull ball, up to 500 grams (or just over a pound). I have a Royal ball winder for smaller amounts but if you are tempted to push it to its limits, the ball come flying off and goes across the room! Well, I guess if I ever push this one to the limit, it might be spectacular! So I've decided if equipment fails me in some way, then move it along and find one that works! This swap came out dead even $$$ wise but I feel like its an improvement and so I'm happy! Weaving: well, I over did it one day last week and so had to take a few days off to rest and ice some tender muscles. I'm happy to report that as of today I have finally finished the fine silks scarves on the Louet Spring. 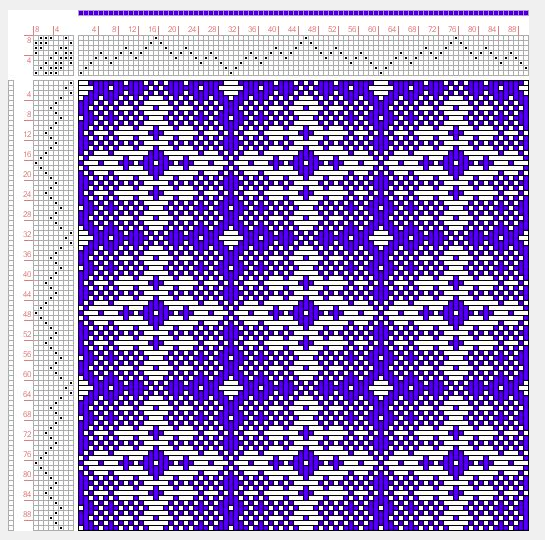 I have to weave some samples for my files and then it will be cut off and finishing will begin. 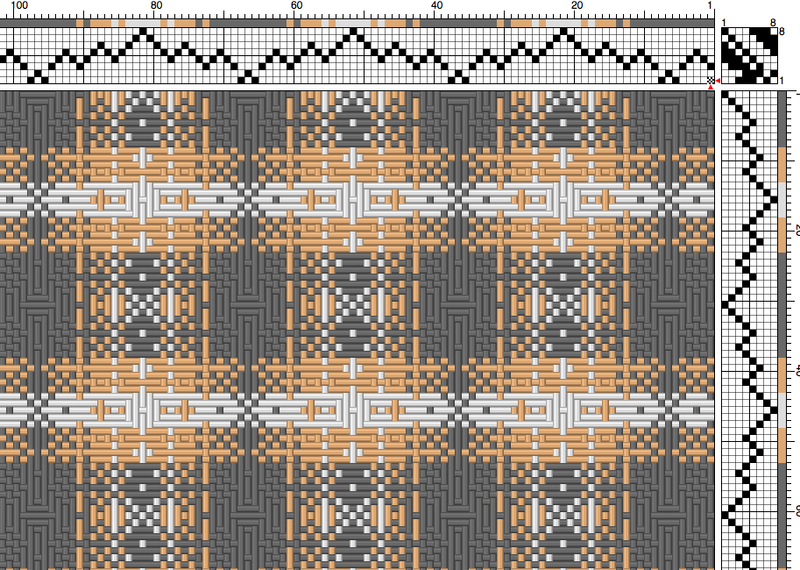 So I hope to have some actual finished weaving to show you next time! I have some projects 'pre planned' on paper and the warp winding will be begin in earnest soon. Standing still in one spot for any length of time is a problem so I will have to do it in stages. There will have to be a tie up change which will also be a step by step thing too. I'm learning the limits of my new inner metal bits! Speaking of waiting.... our daughter in law is due March 10th so not too long to wait. We hope to go over soon, if not for the birth, then shortly after to meet the new addition to the family! In the mean time, we continue to go through closets and our 'stuff' and downsize as we prepare to list the house for sale. Nothing like a quiet recovery huh?